As spring continues to bloom, even the natural gas markets are showing signs of coming back to life after hitting their lowest point of the year. One exchange-traded fund (ETF) in particular that I have noticed start to climb again is SPDR S&P Oil & Gas Equipment & Services ETF (XES). In the wake of an unseasonably warm winter, which was one of the main reasons why natural gas prices fell, the fund has bottomed out and is likely to rise steadily during the next several weeks. After beginning the year at a strong $36.01, XES fell to $33.75 yesterday. It has risen since then and as of midday today the fund traded at $34.24. Established in June 2006, XES seeks to replicate, before expenses, the total returns of the S&P Oil & Gas Equipment & Services Select Industry Index. As a result of the fund’s wide investment in the oil and gas industry, XES has the potential to notch significant gains as long as the natural gas market recovers from its deep decline. Again, my hope is that after taking a battering in the first quarter, natural gas has nowhere to go but up. The top five holdings in XES, as of the close of trading on April 17, are: Core Laboratories (CLB), 2.83%; National Oilwell Varco Inc. (NOV), 2.66%; Hornbeck Offshore Services Inc. (HOS), 2.66%; Seacor Holdings Inc. (CKH), 2.65%; and Lufkin Industries Inc. (LUFK), 2.73%. If the markets recover as I hope, XES offers the promise of producing significant gains. Even among other natural gas investments, SPDR S&P Oil & Gas Equipment & Services ETF (XES) remains attractive. It is not tied to a narrow niche within the Oil and Gas Industry, since XES includes holdings in equipment and services (72.73%), as well as drilling (27.27%). In addition, the fund is low-cost and low-turnover. If you are like me, you like bargains. Without any doubt, I am an avowed fan of investment firms that charge low fees for managing funds. If you want my advice about buying and selling specific ETFs, including appropriate stop losses, please consider subscribing to my ETF Trader service. As always, I am happy to answer your questions about ETFs, so do not hesitate to email me by clicking here. You may see your question answered in a future ETF Talk. Making Money Alert: Can the Global Divergence Last? [youtube_sc url="http://youtu.be/yzYGIYaCiYc"] Over the past two weeks, the S&P 500 Index has broken below its short-term, 50-day moving average on two separate occasions. The big rally on Tuesday lifted the index back above the 50-day moving average, yet there is no denying that sellers have demonstrated a willingness to come back into this market. 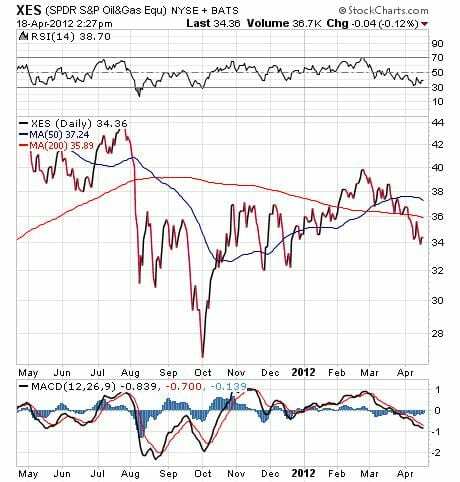 The chart below of the S&P 500 Index clearly shows the selling that has taken place thus far in April.